Joe Perry, former 49ers fullback and one of the first African-American stars of the National Football League, passed away on Monday. He was 84. 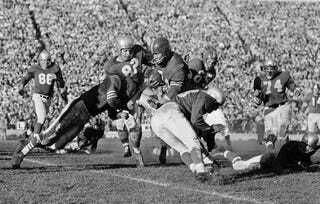 Perry became the first NFL player to rush for more than 1,000 yards in two consecutive seasons in 1953 and '54. He was voted to the all-NFL team in both of those seasons and earned the nickname "the Jet" for his explosive speed. He was also a three-time Pro Bowl player. Perry played football in the military before joining the 49ers in 1948 as the team's only black player, just one year after Jackie Robinson had integrated major-league baseball. "It was tough," Perry told Football Digest magazine in 2003. "There were a lot of bad things that happened, lots of things that were said to me on the field … It was harder for me [than for Robinson] because in football, there's so much physical contact. I had to be on guard at all times for something." Perry played for the Colts for two years before returning to San Francisco for his final season in 1963. He remains the 49ers' all-time leading rusher. He was elected to the Pro Football Hall of Fame in 1969. Perry suffered from dementia that, according to published reports, Perry's family and his doctor believed was caused by repeated concussions while playing football. His brain will be donated to a study at Boston University analyzing head trauma among football players. He is survived by his wife, four children, a stepdaughter, and many grandchildren and great-grandchildren. In other news: Homeless Woman Faces 20 Years for Enrolling Son in Wrong District.